While growing older does not necessarily constitute a safety risk, when to stop driving is a decision that should be made by the older driver and the older driver's family. Since driving is such a critical form of transportation for the older driver, it is also a very difficult decision to make. There is no clear-cut factor to look at in terms of stopping driving; however, PennDOT continually seeks to balance the safety of our roadways with the impact of loss of independence, autonomy, and mobility of the older driver. Have regular eye and medical exams. Near and distance vision is needed to drive safely. Aging eyes become more sensitive to bright light and glare, so limit nighttime driving and try to avoid looking directly into headlights of approaching vehicles. Avoid stressful driving situations such as rush hour travel, driving at night or driving in bad weather. Plan trips for daytime hours after 9 a.m. and before 5 p.m. to avoid rush hour traffic. Plan. Know your route and try to stay on familiar roads. Avoid travelling in bad weather, if possible. Avoid taking medications before driving. Many medications — prescription and over-the-counter — cause drowsiness and can affect safe driving. Make sure your driver's seat and mirrors are properly adjusted prior to beginning a trip. Maintain a safe speed and look ahead. Controlling your speed and looking down the road for possible hazards allow you to adjust before encountering a problem. Always keep a safe distance from the vehicle ahead of you. A 4-second gap between your vehicle and the vehicle in front of you is recommended. The National Highway Traffic Safety Administration has produced 11 videos for anyone to download and use as a tool to educate on the key medical conditions common among older drivers that can impact driving abilities. To help keep Pennsylvania roadways safe, it is extremely important that those licensed to drive are physically and mentally capable of safely operating a motor vehicle. This is important not only for the safety of the driver, but for everyone with whom they share the road. It is everyone's right to be protected from death, injury or property loss caused by drivers unable to safely drive because of a medical condition. To help PennDOT detect those drivers who are unable to drive safely, health care personnel in Pennsylvania are mandated by law to report their patients who have conditions that impair safe driving. For more information on Medical Reporting visit the website here. 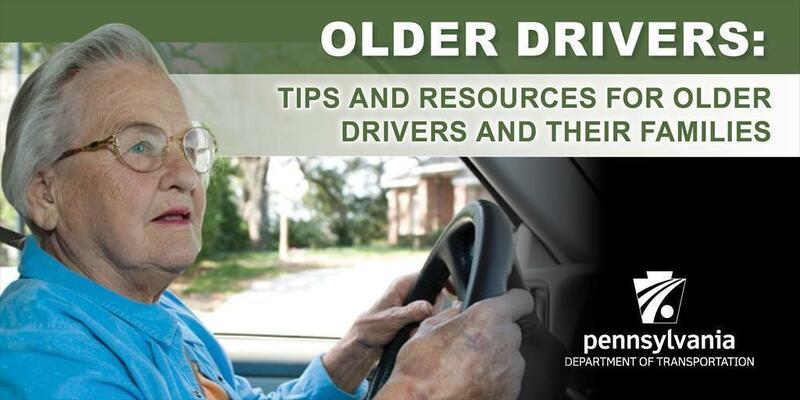 In addition, under Pennsylvania law, drivers 55 and older are eligible to receive a 5 percent discount on their vehicle insurance by completing the Basic Mature Driver Improvement Course. To maintain the discount, individuals would have to take the Refresher Mature Driver Improvement Course every three years. Individuals should check with their insurance carrier for specifics of their program. Older Pennsylvanians are eligible for the Free Transit Program for Older Persons, where available, and the Shared Ride Program. For more information, visit the Seniors and Persons with Disabilities on Public Transit section of our website. You may also see whether your county has these services on our Public Transportation Services and Programs Map. You may also contact PennDOT's Bureau of Public Transportation at 400 North St., Harrisburg, PA 17105-3151, or call (717) 783-8025. For more information on Welcome Centers, visit www.penndot.gov and be sure to Follow PennDOT on Facebook, Twitter, and Instagram.